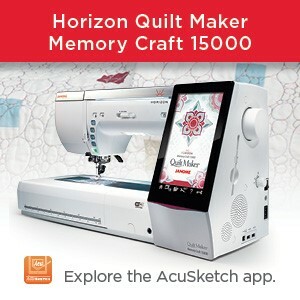 ← Sew a Rug on the Janome HD 3000BE! Regular style zipper bags and humbug bags. All these humbug bags were embellished with rows of machine decorative stitching in a variety of decorative threads before being trimmed & sewed up into the distinctive HUMBUG candy shape as well as the usual cosmetic baggie style. Not sure about you, but I have long been a fan of making little baggies. (and some bigger baggies too as you will have seen in a recent post). I find they really don’t take up a lot of time which is always a scarce commodity in my life (and probably in yours too). They are practical and useful for my purposes + I like to keep a few to give as very appreciated gifts to family and friends. And they use up small pieces of fabric so are a great stash buster project. We all have bits of fabric left over from various quilting and sewing projects so this is a great way to use them up. Good use of smaller pieces of batting too. 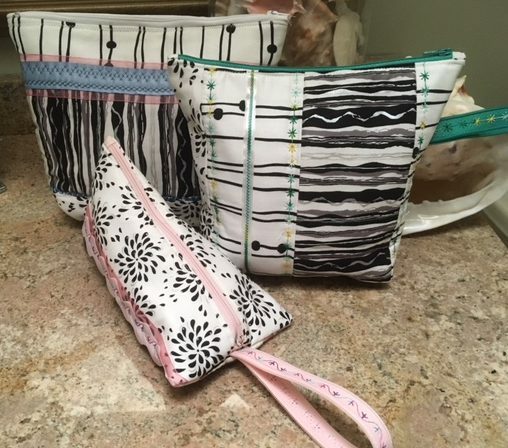 I thought I would show you a few baggies I made recently where I “busted my stash” AND had fun embellishing the baggies with scraps of ribbon and trim + decorative stitches. The sky is the limit when you get going on a creative roll. And another good thing is that the fabric you use does not have to be the full size of the baggie. We are quilters after all so we can piece smaller pieces for a very pleasing pieced look. And you can also piece the lining of the baggie if necessary. 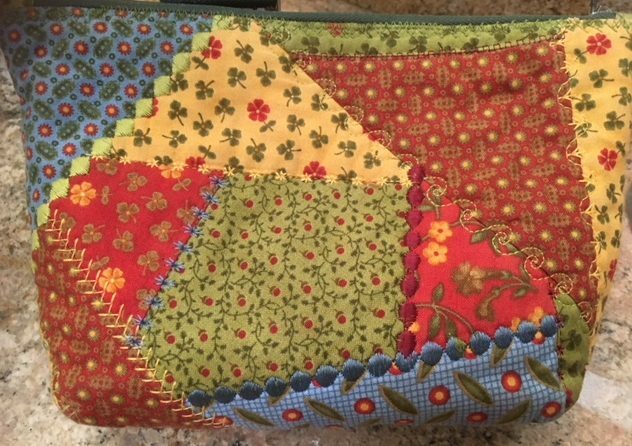 This zipper baggie was made using a crazy patch style piecing using charm pack “left overs”. I stitched in the ditch on all the seams with decorative stitches to embellish like you would on a crazy quilt. And this is the other side of the same baggie above. 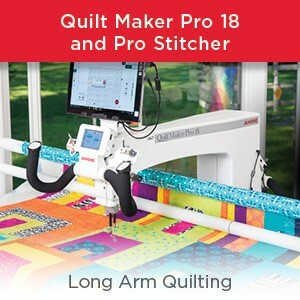 OR simply do a flip & sew quilt-as-you-go technique so your piecing and quilting is done in ONE step. That is what I did with all of the black & white print baggies. I particularly like the technique where you add little tabs to the ends of the zipper as the end result of the zipper insertion is so much neater and nicer. I use that technique on all my baggies now. See pic below. Little yellow arrows show the tabs that are added to the ends of the zipper which neatens the baggie closure considerably. Note how I layered 2 ribbons (one was sheer organdy ribbon and the other was satin ribbon) and did a dec. stitches over the top to secure them to the bag. It was super quick to do but adds a nice effect + some texture or dimension to the bag. What about using your embroidery machine test stitch-outs? You do test stitch-outs, right? 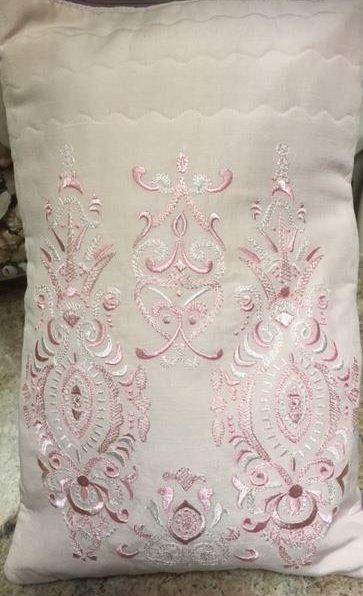 I had this one (below) and thought it would look really nice on a slightly larger baggie as I did not want to fold or cut the embroidery design. What will I use this baggie for? Possibly when I travel it can be my little laundry bag for my underwear & socks? Or perhaps it can be a baggie in my bathroom cabinet holding things like hair bands or velcro rollers? Or perhaps it might be a gift for a friend with a sewing magazine or 2 popped inside? 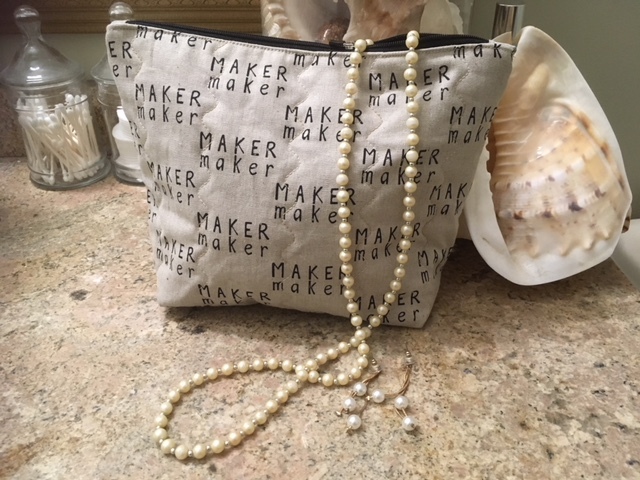 We are launching 10 new machines this Fall……yes, you heard right TEN……and many of them could be used to have fabulous sewing time to make lots of pretty and practical little baggies. 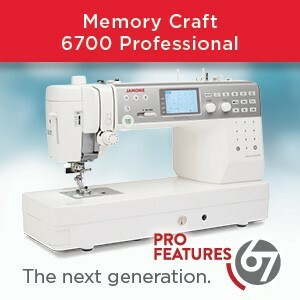 I can hardly wait to get my hands on these new machines and make some more baggies! 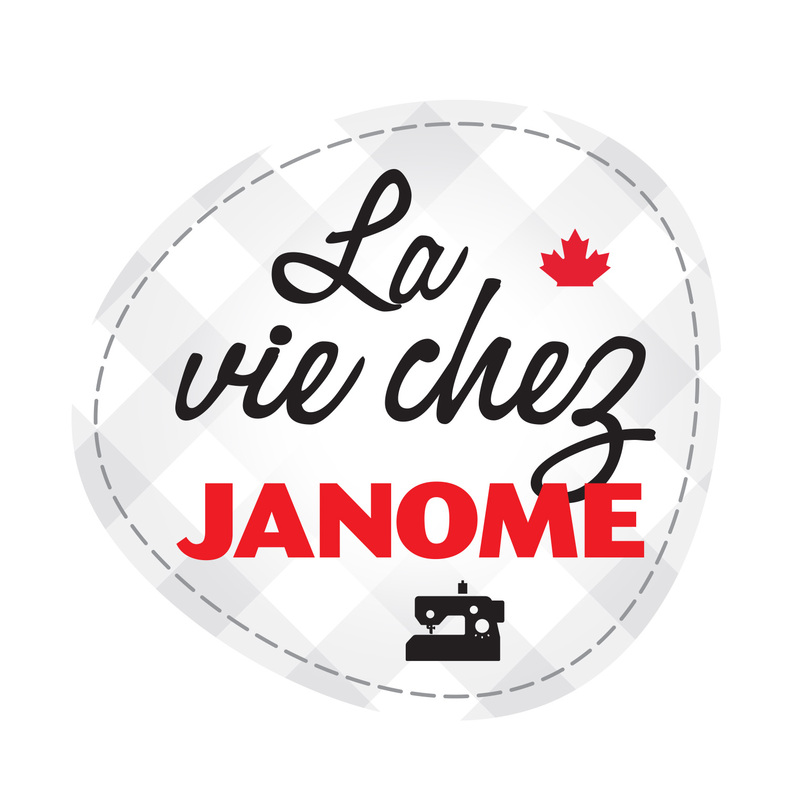 And here is a great tutorial from one of our Janome Canada artisans, Trina, which was published on janomelife a few years back. As you may not have seen this or possibly forgotten it, take a look! She shows us step by step how to make a vegan leather storage baggie. Subscribe to our janomelife blog if you are not already on our list. Just this week, as I write this post, I received a query “My friend got an email about xyz but I did not. Why is that?” Well the answer to that is easy: she is not a follower or subscriber to janomelife. You will only get emails from us if you have signed up. And the email is just to alert you that we have published another janomelife post. You get such an email each time we publish a post with more information, hints, tips and advice about your favourite Janome products. 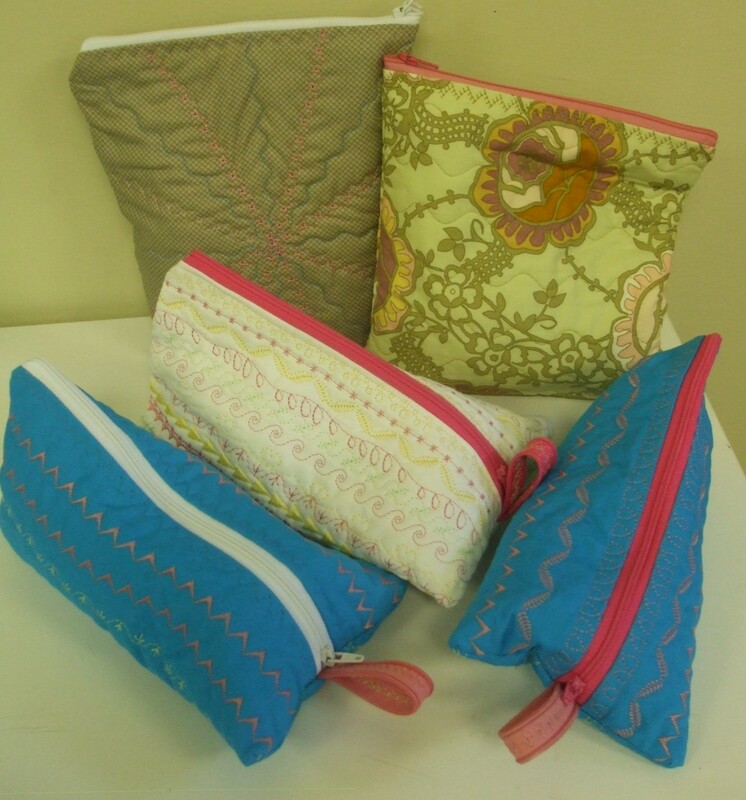 You might want to sign up today so you don’t miss out on all our sewing fun this Fall! What have you got up your sleeve for Fall sewing? 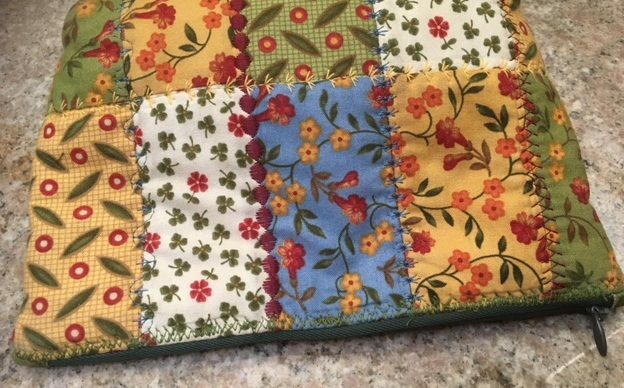 Has this post with a bunch of variations on a simple project inspired you to get back to sewing?? We hope so. Let us know what you are planning to sew. 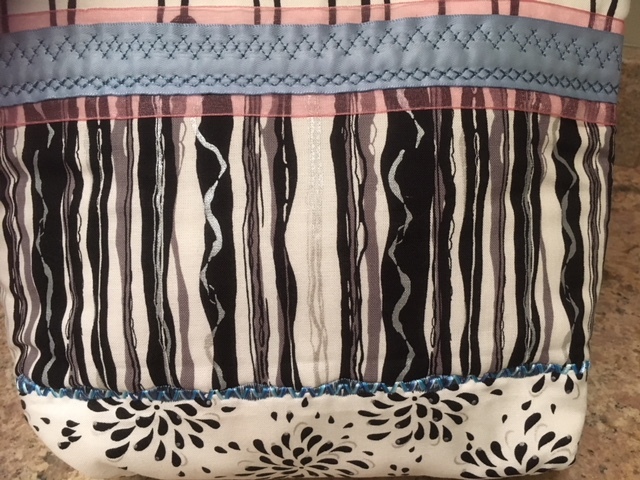 This entry was posted in JANOME PROJECT IDEA and tagged Janaome back to sewing project, Janome Border Guide foot, Janome decorative stitches, JANOME PROJECT IDEA. Bookmark the permalink.